Two Championship footballers have been charged with burglary in connection with the theft of items from a Portsmouth nightclub. Southampton Football Club striker Bradley Wright-Phillips, 23, and winger Nathan Dyer, 20, will appear before Portsmouth magistrates on 8 July. They were arrested in March over claims that items were taken from Bar Bluu nightclub, Southsea, on 28 February. Southampton FC has declined to comment on the case. Bradley Wright-Phillips, of Briton Street, Southampton, is the son of former Arsenal and England player Ian Wright and the half-brother of Chelsea and England player Shaun Wright-Phillips. 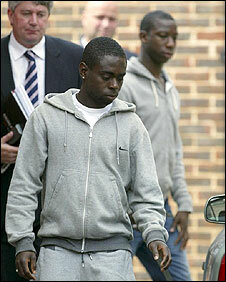 Nathan Dyer, also of Briton Street, was a member of Southampton's youth team before playing for the Championship club. Staff members at the nightclub claim three mobile phones, £145 in cash, student cards and cigarettes went missing from three handbags. Police launched an investigation when a group of men were filmed on CCTV entering the unlocked staff room. The pair were charged after answering police bail at Portsmouth central police station.